Goltzius worked both as a painter and a copper engraver; he founded his own publishing company and experimented with new artistic techniques. 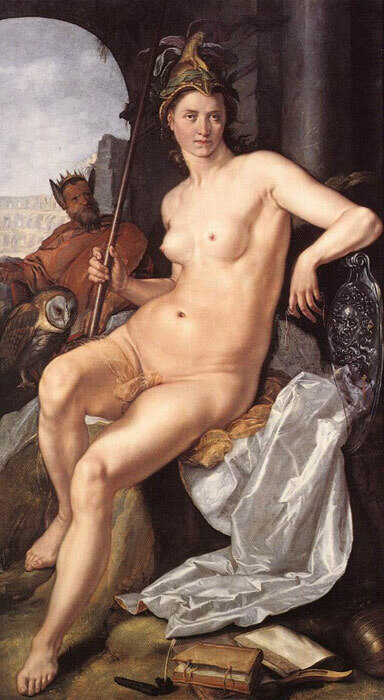 Of equal importance, however, is the thematic content of Goltzius' paintings. It demands autonomy for the medium of painting: painting must not become an instrument in a war of religion. In Goltzius' oeuvre, painting presents itself in a confident manner and his portraits of fellow artists puts them on an equal standing with the humanists and poets. Besides this, however, visual art itself, with all its possibilities and limitations, also becomes the subject of art. SPECIAL NOTE : The painter will make the reproduction as close to the original oil painting as possible. If you want your painting to alter from this likeness, please email us and " Minerva, 1611 " will be reproduced according to your special requirements.